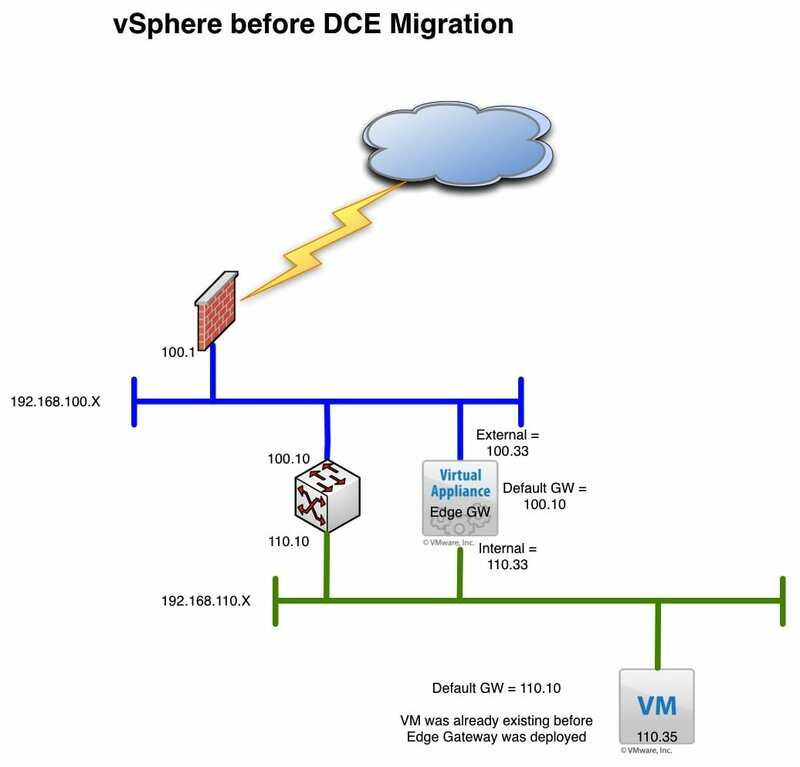 Part 2 of this series on how to set up vSphere Stretch Deploy with vCloud Air will deal specifically with the requirements and workings of the vShield Edge Gateway component in the local vSphere infrastructure. The reason I think this aspect is important is that from my experience most vSphere only customers may have never introduced this into their environment. However, it is a requirement for the Stretch Deploy SSL VPN to get created between the public cloud and your local datacenter. Frankly speaking this was the first time I ever deployed one and I started with a few questions of my own. How am I going to introduce a firewall to my existing environment? I don’t want my existing port group firewalled! Firewalls usually use NAT and security rules will I need those? Will I need to change the Default Gateway of the virtual machine? How is the traffic going to flow once it’s moved? The good news is so far I have seen some pretty interesting answers to these which I will attempt to answer. How am I going to introduce a firewall to my environment? When I started to think about this I was in the vCloud Director mode of thinking. That when you deploy a vShield Edge Gateway it has two interfaces where one is external and one is internal. The internal is using NAT and the virtual machines are all on the NAT subnet. However, in the use case here the virtual machine is existing, but Stretch Deploy will not configure without the portgroup having an Edge Gateway on it. I started to stretch my head and just take a stab at something. Note: I have noticed some of the firewall rules get created at he start of the process, but the final SSL VPN does not appear to be done until after the virtual machine is copied completely. What do I need to do now that I Stretch Deployed my virtual machine? There is about 50 articles out there on which buttons to click so I am not going to repeat those. However, I do want to touch on some of the things I have been thinking about. Especially the network connectivity flow since we have assumed we are not changing any information about the virtual machine. Below is the “After” picture once the process is completed. Most notably you will see there is some duplicate IP information on the internal side of the two Edge Gateways. This is fine and if you did have machines behind the NAT in the original location using the Edge Gateway as the default gateway, things will continue to work the same. In this case however we said originally the Default Gateway of the machine we are moving is already set to the corporate gateway. This is important as there may be upstream rules that are using this IP address for something and we want to keep things the same. In this case the Stretched machine will still be able to reach its original Default gateway through the Bridge Mode SSL VPN and traffic will flow accordingly. Nothing should need to be changed for connectivity to work as if the machine was in the local datacenter. We do not require any Edge Gateway firewall rules or other things to establish connectivity to the machine. I was also able to ping the stretched machine from my laptop on the .100 network. What about multiple virtual machines on the same network? This is something I will try to tackle in part 3. I am also thinking about the question, “Can I add a NEW machine in the cloud as part of the vApp network that has been stretched using the original subnet from a vCloud Catalog Item”? What happens if I have other virtual machines on the original subnet I want to move to the new Stretched vApp? These are the next two common things I think will come up when dealing with this use case. I also want to try to discuss the process by which you would do these other additions. This is proving out to open up some more interesting questions and answers about this technology and feature. I am sure I will get some good conversations at VMworld about it! This doc is great Chris! I had not made it to it…LOL. We’ve had to move into some other things with PEX, but we are building a new lab so I can come back to some of this.